The seat at Howmore commemorates the life and contributions to the Gatliff Hostels of the late Arthur Meaby. He followed in the steps of Herbert Gatliff who provided accommodation for those wanting to explore the Western Isles. 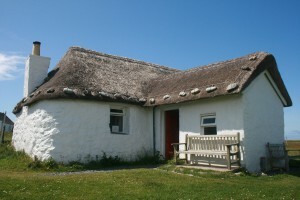 Sit and note how this hostel is situated in a village well-known for its number of blackhouses and for a variety of ecclesiastical buildings, both ruined and in use. The machair is on one side; the mountains on the other. It’s little wonder that the 50 things to do and see that are listed here give much pleasure to hostellers.